The Mountain Top region of the Catskills is home to an amazing number of artistic, creative, and literary people. Cindy Smith is one of them. 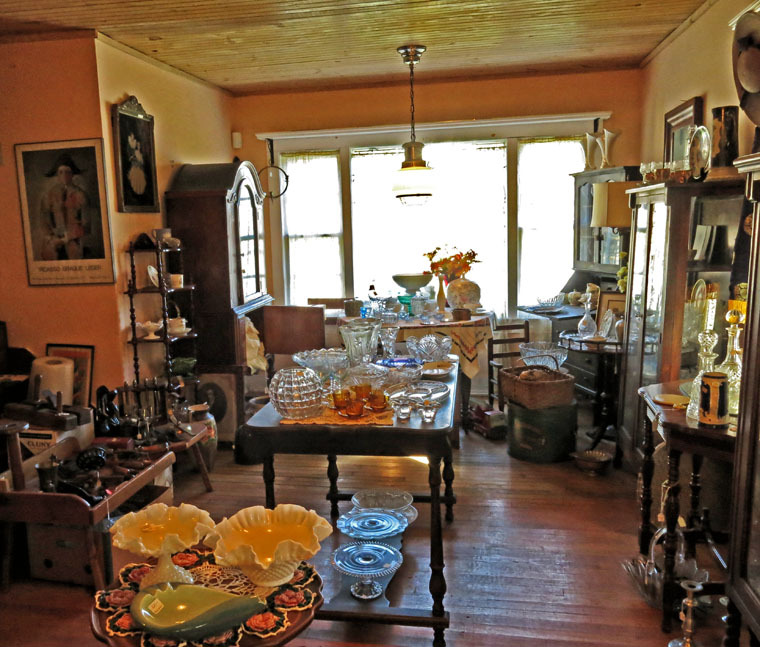 Cindy and her husband, Dan, operate the Antiques store located at the crossroads of Routes 23A and 296 in Hunter (you can’t miss it–it’s just to the west of the junction, on the north side of 23A — at 8176 Main Street). Cindy’s path and mine first crossed at the Mountain Top Historical Society‘s annual Open House, where we were each selling our wares. Because of my interest in historic sites, for possible photographic subjects, I was attracted to the reproductions of historic postcards that she sells, and I bought some for future reference. Not long afterward, I met up with her again at — guess where — a postcard show sponsored by the MTHS at their Haines Falls headquarters. And so during one of my days of rambling round the Mountain Top with my camera, I stopped into Cindy’s store to see her in situ. 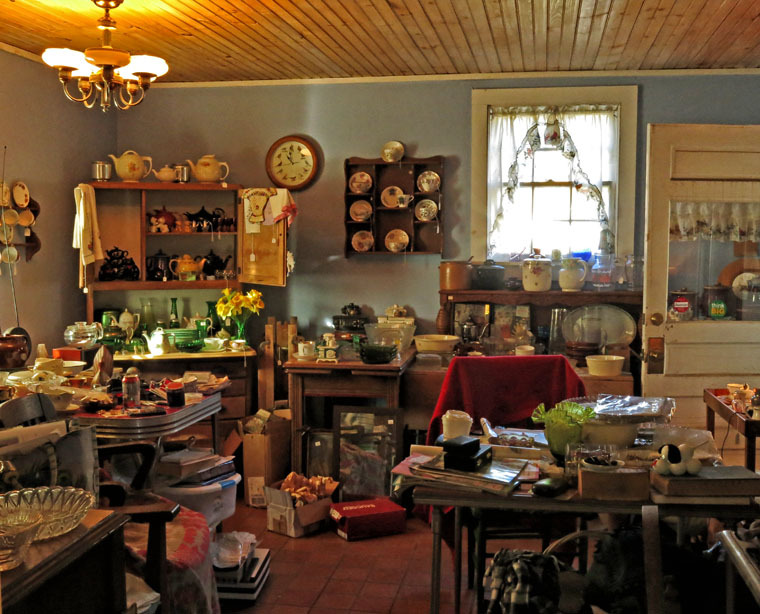 I was amazed at Cindy’s knack for filling these few rooms in this lovely old building with as many wares as possible without the effect being one of clutter and jumble. Actually, the ambiance was warm and homey. I loved it. 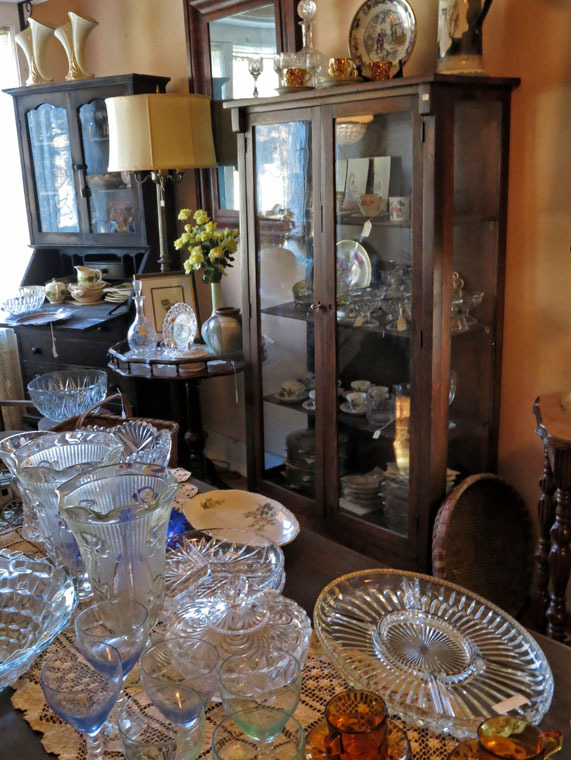 In addition to the gently used items — “Old Treasured Belongings,” as she calls that side of her business — she also operates “Handmade by Cindy,” items she makes herself. Handbags in various styles and colors, scarves — you name it. In addition to her store, Cindy can be found at the many Holiday Craft Fairs in the area. I believe she and I will both be selling at the Craft Fair in Windham on December 14. These are some photos I took inside Cindy’s store (with her gracious permission, of course). I’ll be processing some photos as “vintage” images and will post them on my photo blog when they’re ready. Speaking of photos, you can now purchase signed copies of my book Historic Hudson Valley: A Photographic Tour at the Tannersville Antique & Artisan Center! Be sure to check out this fabulous shop and gallery run by Rick Thomas. Actually, it was Cindy Smith who first alerted me to this Center — another example of the close-knitted artistic community on the Mountain Top.